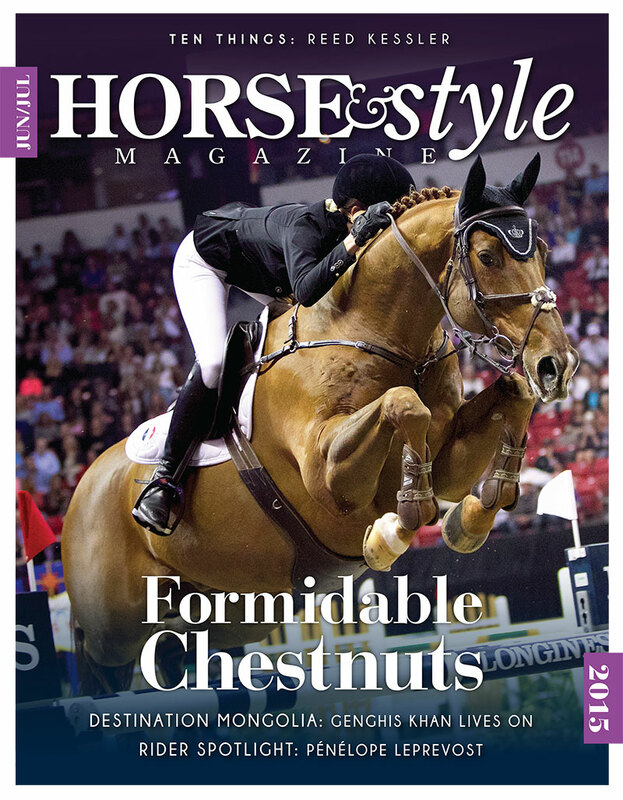 I had just returned from the 2015 FEI Longines World Cup™ Finals in Las Vegas when I began this journey of finding four chestnuts to write about for Horse & Style. Of course it wasn’t difficult, as essentially all of the athletic equines at this world-class indoor event have stories worth telling, and more than four of them are chestnut in color. So I picked four and look forward to picking more. So to forego that title seemed a clear choice, and the word ‘formidable’ came to mind. Defined as “inspiring fear or respect through being impressively large, powerful, intense, or capable,” certainly seemed fitting. These four chestnuts are impressive, and have earned respect through powerful performances in intense settings. 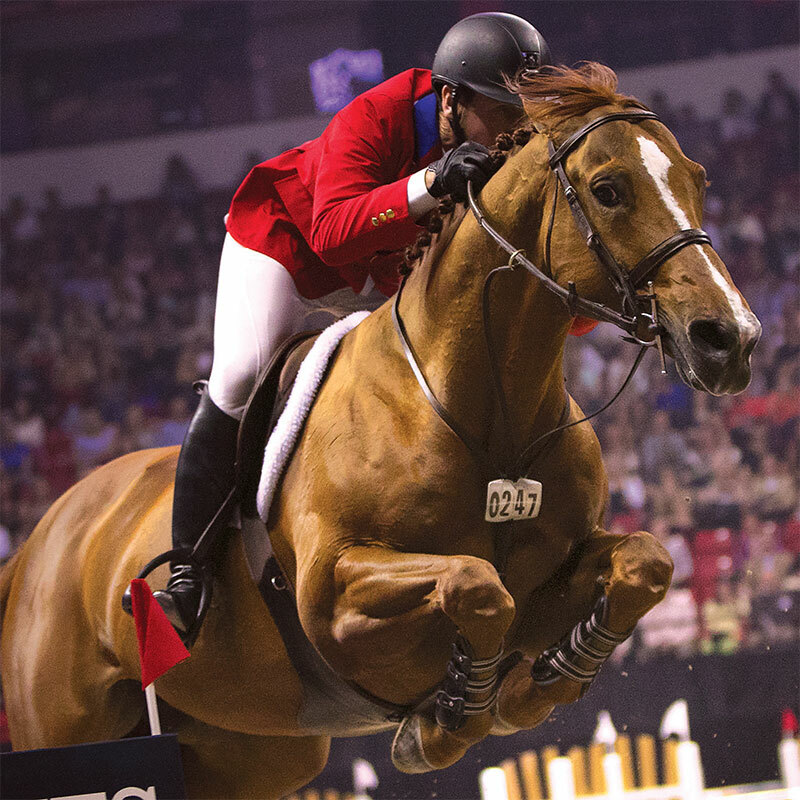 Most show jumping fans know these horses in the ring, having watched them perform in person or televised from Olympics, World Equestrian Games and World Cup™ Finals. Through my interviews for Horse & Style I found these horses to have distinct personalities and of course a common color bond, chestnut. Are they all hotheads? Is the red color part of the reason? Genetically that is not proven, but interesting to ponder. Certainly we could all identify more fiery and famous chestnuts, and after this small step to a longer journey I believe this exploration could continue. Steve Guerdat’s mount for the World Cup™ Finals, Albufuerhen’s Paille, is one—at press time we were still working on the interview – as Guerdat went from Vegas to GCT Anvers to GCT Shanghai to CSIO La Baule. Another two come to mind as I write, Paulo Santana’s mighty mount, Taloubet and Coral Reef Ranch’s stallion Baloufino, piloted by Vinton Karrasch. At press time three of the four fiery formidable chestnuts, Flexible, Rothchild, and Kiwi Iron Mark, are on their way to Spruce Meadows for some competition in Calgary, while Barron will be competing abroad. Fiery, not calm; cool as in ‘radical’, and fiercely competitive, while as collected as possible, describes this foursome of equine athletes. Matched with riders willing to work with their unique quirks, these formidable chestnuts will continue to reach heights that impress us all. Your formidable chestnut recommendations and thoughts are welcome. 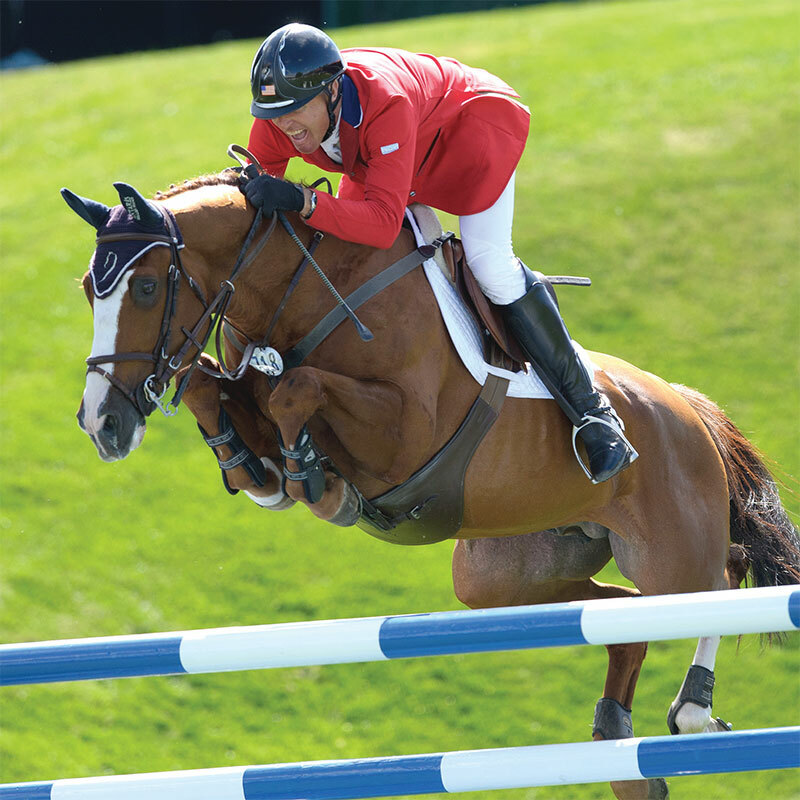 After thirteen years together, Flexible and Fellers share a long list of show jumping accolades, with a plethora of amazing stories along the way, including a 2012 FEI World Cup™ Champion title, the highest place earned by an American at the 2012 Olympics (8th) and 2012 USEF Horse of the Year. He recently won the Grand Prix of California and was second in the Del Mar National Grand Prix the week before. Plus the fiery chestnut has survived and surpassed two potentially career-ending injuries. Fellers explained what makes Flexible unique. When we spoke, Fellers had just returned from competing at the 2015 FEI Longines World Cup™ Final in Las Vegas, where they finished seventh overall. After going into the final day one point behind the leader, some would consider a drop to the seventh spot a disappointment, but not Fellers. Of the four formidable foes, Flexible comes in the smallest package at just 16 hands. His size has never been an issue, it actually adds to the impressiveness of his uncanny talent. Flexible may be fiery but he is also full of heart. 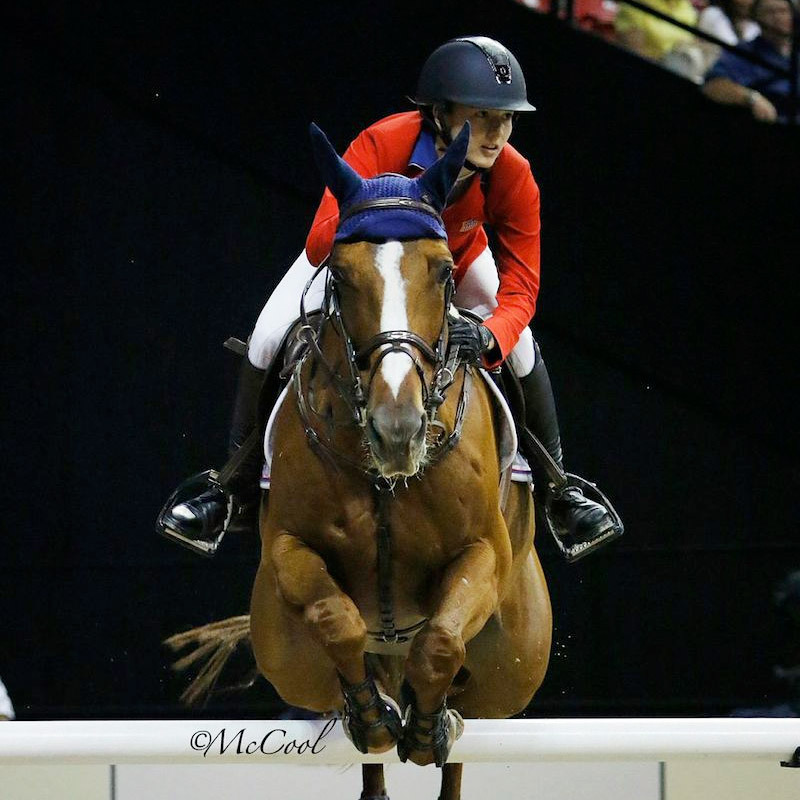 Americans didn’t know much about this Kiwi chestnut before the 2015 FEI Longines World Cup™ Finals. Not having been on the world stage much at just eleven years old, and challenged by the space in the Thomas & Mack Arena at seventeen hands, this scopey show jumper nevertheless proved he could persevere. New Zealander and new mom Katie Laurie is not new to the international arena. 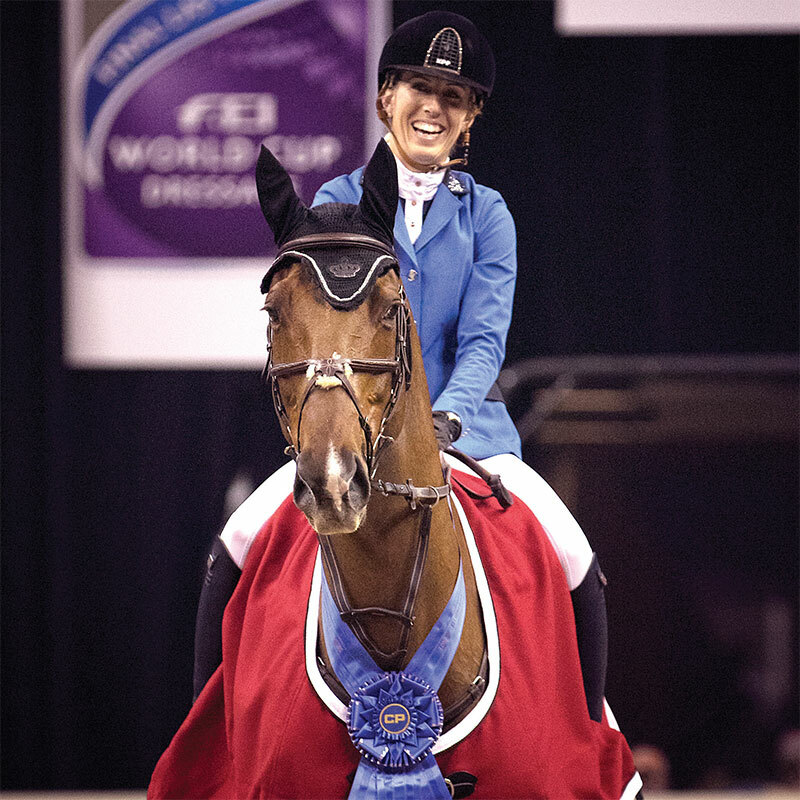 She comes from a show jumping family, and under her maiden name McVean she rode the young mare Dunstan Delphi to success at Spruce Meadows and in the 2010 Alltech FEI World Equestrian Games. She’s been working with Mark since he was a six-year-old. “The circuit at home [in NZ] is close-knit, so you become friends with everyone. A friend of mine owned him and rung me up asking ‘Could you ride my horse this weekend? I’m not very well.’” It turned out that her friend had cancer, and although a fighter, passed away a year later. 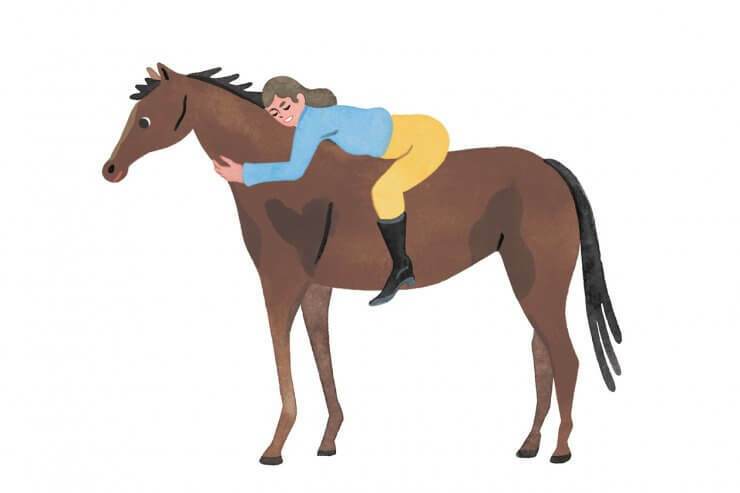 “She did get to ride him during that year. He was so gentle with her. He can buck and kick but never did with her, he knew,” Laurie said. What makes Mark formidable besides his big heart? Laurie’s developed a routine for his warm-up that always includes a cross-rail and ends with a skinny oxer. Not a big fan of the warm-up ring, Mark’s ears perk up when he knows he’s heading to the show arena. At the World Cup™ Finals in late April, Laurie and Mark had some trouble in the difficult triple combination on Day Two, not qualifying for the rounds on Sunday. She wanted Mark to get another chance in the ring and decided to compete in the Canadian Pacific Grand Prix on Saturday. Laurie’s summer goal is to be chosen to represent New Zealand on the team heading to Hagen, Germany for the Olympic Qualifier at the end of August, getting some good miles along the way in Calgary. Yes Laurie would label Mark a chestnut on fire, however he is a gentle giant. He’s the only horse she has put her daughter Grace on (who was ten months old at press time). Rothchild entered Ward’s string in 2007 as a six coming seven year old. For Ward, the story of Rothchild is one of many fond memories of his father Barney. “I didn’t want to buy him. I actually refused to buy him. My father bought him while I was on the airplane.” Five years after the horse came to the barn, Barney lost his fight with cancer. The fierce chestnut has without a doubt proven worthy of purchase as well as the title of ‘formidable’. Upon watching his ears-pinned expression while competing, you would think the horse was an angry, resistant schoolmaster, not an international superstar. Posting several impressive wins, including LGCT’s 2014 Grand Prix of Antwerp, 2014 World Team Bronze Medal and two very close seconds in the 2015 HITS Million Grand Prix events in Thermal and Ocala, one of the most bittersweet Rothchild stories comes from the 2014 Alltech FEI World Equestrian Games in Caen. After some incredible performances, including going first on Day Two and giving the world a lesson on how to ride a difficult course clean, notably only twelve other competitors out of over a hundred matched that feat, the pair continued to go fault free moving up from 14th to 5th on the leaderboard. Fifth is by all accounts a superb finish in a World Games. However, all of us who followed this feat, secretly wanted to see the best riders in the world attempt to ride this fierce warrior in the Final Four. As with any top athlete, their training program is uniquely their own and in this sport knowing what suits your horse is essential. Calm, cool and collected doesn’t describe Bongo, however Ward said ‘chestnut on fire’ would be an appropriate description. Just over 16h with a warrior mentality, Ward agreed that Bongo has a huge heart. Renzo is one of Lucy Davis’s favorite architects, so when they decided to name her show jumper Barron after her grandfather, Robert Barron Frieze, she started calling him Renzo in the barn. “He’s a little flamboyant, it works,” she commented. In the two and half years she’s competed on Barron, the pair has earned several significant titles, including a 2013 LGCT Lausanne Grand Prix, 2013 Rotterdam Furusiyya Rider of the Day award after jumping a double clear in the Nations Cup for Team USA, a 2014 World Team Bronze Medal and a top ten finish (9th) in the 2015 FEI LONGINES World Cup™ Finals. Often based in Europe and competing all over the world, Barron has also traveled with Davis to Stanford so she could finish her degree. “He loves the Stanford barn. He’s relaxed and calm. He’s still a punk when I ride him, spooking at everything, but he likes the environment.” Soon, however, they are off to Europe for the summer where Davis will be based in Holland with Erick van der Vleuten. Read Horse & Style’s full June/July ’15 issue online here.